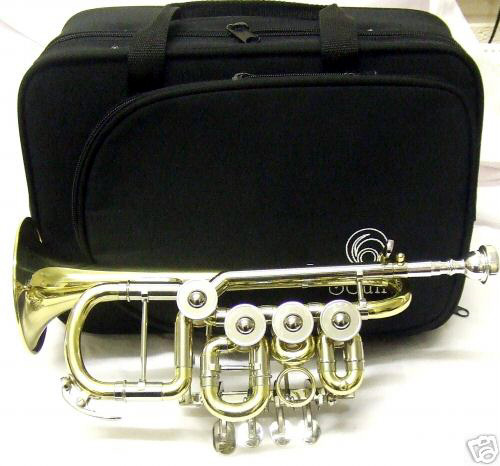 I came across a cheap chinese rotary valve piccolo trumpet on Ebay and paid about $400 for it. The brand is "International Sound" but I happen to know that its made by Jinbao, China's largest group of instrument factories. Its clearly based on the Scherzer design but this one has a bore of 11.5mm compared to the Scherzer's 10.4mm. (Update: I eventually found out that it is copied from the "Melton" branded rotary trumpet which was made by Scherzer in the 80's). It sounded a bit flat towards the top of the range. I managed to find an adaptor to fit my normal mouthpiece to it and that seems to have corrected the intonation. The alleged 7c was far too deep, closer to a Bach 6 in cup shape. 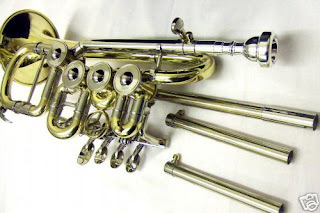 I spent most of a day working through lots of literature from Bach, Handel and Telemann and it sounds very lyrical as you would expect from a rotary trumpet. The problem is that quality control in China is so poor its possible the next one in the batch would be a real dog, so if you decided to take the chance on one you should try and play a few. Obviously another important issue is that it is a rotary valve trumpet. If you have never played a rotary then you will find the adjustment quite difficult so first impressions might not be very good. For example, slurring on a rotary is not as good as on piston valve instrument because the valves cut the air flow more abruptly. Well, I am doing the Telmann Concerto for trumpet and two oboes with orchestra in March and have decided to give the rotary piccolo a chance to perform. I am now using my Monette AP1-5 mouthpiece jammed into a cornet to trumpet adaptor with some insulating tape. This is some video of me practicing the concerto. Poor audio is due to the webcam microphone. These two clips were done on a different microphone and the trumpet has a Blackburn leadpipe fitted which makes the intonation better but impedes the upper register a bit on the very open mouthpiece I am using. 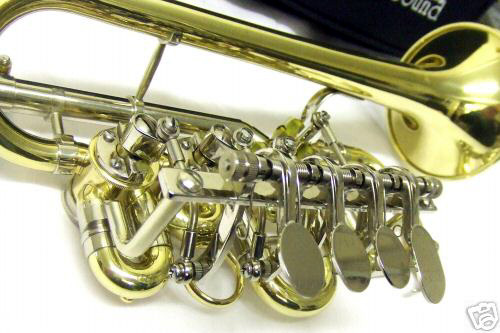 I think to get the best from that setup you would need to be using a conventional Bach, Yamaha or Schilke mouthpiece set up. Well, five years later and as I move this web age to my other hosting account I am still playing this trumpet. I bought a Blackburn leadpipe for it in the key of A which significantly improved the playing. This cost me about £100 at the time as the exchange rate was good. I eventually switched to using a Josef Klier 7DW mouhpiece which is like a Bach 7DW, but with a bigger backbore. My love of this trumpet has not diminished. It is still in regular use. A tiny amount of lacquer has come off, but it is still playing well. I am about to embark on a recording of the Vivaldi double concerto on it. The same instrument is now being sold by John Packer and Dillon Music with their respective names on it. Prices have gone up since I bought mine, but it is still a good buy I think. I believe they sell in reasonable numbers but I rarely see them come up second hand which suggests to me that people are happy with them. I had the opportunity to switch to buy a new Yamaha piccolo trumpet recently, but decided I wasn't going to gain anything by switching. I might have gained a slightly easier upper register, but would have lost some tone quality.